And that’s all I wanted . . . to be alone in my house on Mother’s Day. While I know in 1o years or less, I will really want to be with my kids on Mother’s Day because they won’t want to be around me anymore, today I just asked to be alone for a few hours. In my house. And I’m not doing anything special. I may take a 20-minute break to read a magazine but I’m working through the laundry and the bills and a hundred other things I have to do, but I’m doing them uninterrupted and at my own pace (which is much faster than when there are littles around). And instead of getting dressed up and taking my mother to an overcrowded restaurant, we are hitting some of our favorite antique haunts for the afternoon. My mom and I get to see each other a lot but rarely without my children. It will be a joy to spend time just the two of us doing something we both enjoy. And I will spend time with the family later. We’ll have dinner and enjoy the evening, but for now, I’m enjoying the quiet and the space . . . of our home. Got this that day. 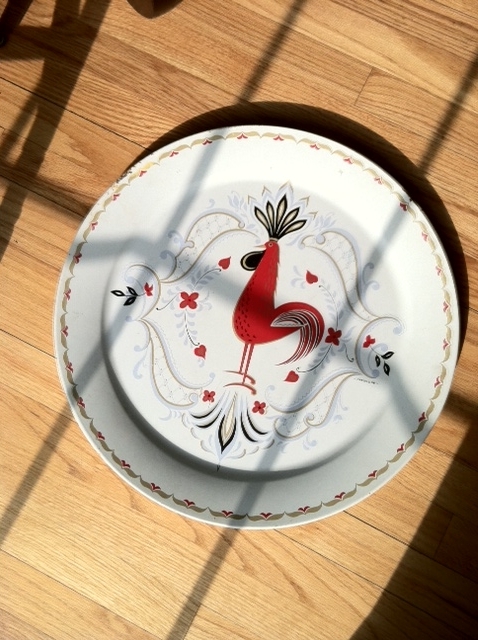 This little guy has a lot of what I love: red, tray, kitsch, a French vibe . . .